PAY-WHAT-YOU-FEEL – The donations will go towards organising the event I.e. venue fee, sound engineer, rehearsal studio. 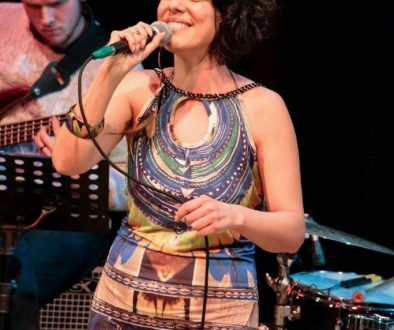 Suéli Gil will be delivering songs from her extensive repertoire, as part of building material for her live CD compilation and for a future documentary on the Leeds Jazz music scene. 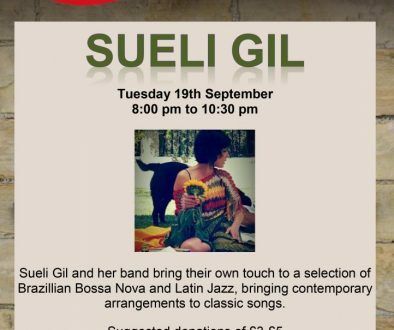 Alongside her faithful band, this is an uplifting and celebratory concert, where Suéli will perform a selection of Bossa Nova and Latin American popular music; classic songs by iconic composers such as Tom Jobim and Ary Barroso; and hits from the Música Popular Brasileira genre. In the spring of 1963, Brazilian Guitarist João Gilberto, composer António Carlos Jobim and American Jazz Saxophonist Stan Getz gathered at A&R Recording studios on West 48th Street in New York to record what would become arguably the greatest Bossa Nova album of all time. Half way through a tense and difficult session, João’s wife Astrud, who had never sung professionally before accepted her husband’s invitation to sing on the genre defining track Garota de Ipanema. Not only did it go on to become a worldwide hit and won a Grammy for Record of the Year, it also heralded the arrival of one of Bossa Nova’s greatest and most iconic female vocalists. 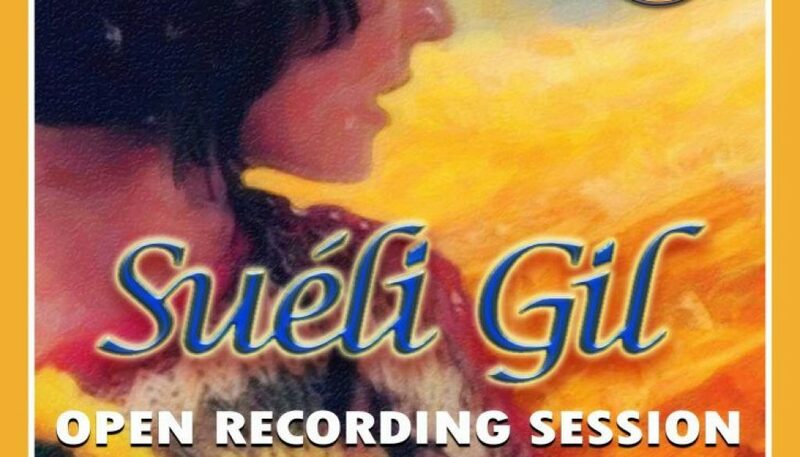 And much like Astrud Gilberto, Suéli Gil is one of those rare and accidental finds; a virtuosic vocal talent with technical mastery over her voice who has never had any formal training or set foot inside a conservatoire. A musical polyglot from the town of Portimão who mixes different cultural backgrounds and influences from Brazil, Angola and Portugal, Suéli displays a vocal style that references the great luminaries of the past such as Elizete Cardoso and Elis Regina but remains uniquely her own. On Bossa Nova classics such as Água de Beber her voice reveals great poise and versatility, and her subtle phrasing is despojada and rhythmically complex. On her own compositions such as the ephemeral Girassol her delivery is more intimate and elegiac or by contrast on the joyous O Tempo é A’ hora which was written as paean to her childhood, she channels a wit and playfulness that is reminiscent of Águas de Março. There is a word which is unique to the Portuguese language and for which there is no direct translation in English. Saudade is often used to convey a profound sense of longing or nostalgia for things past, yet it has an elusive quality that often defies description. It can’t be explained or written down, but sometimes you just feel it and when you do it all makes sense. It’s a bit like when you hear Suéli Gil sing Paciência from Lenine for the first time. Other projects – Prohibited Strangers, National Youth Jazz Orchestra, Northern Contemporary Collective, Karpenters. Currently also plays with Mansion of Snakes, K.O.G. & The Zongo Brigade and Cameron Vale. Other bands – Necktr, Alexys Reid band, Tropic and InPulse duo. Also plays with Tom Sharps Jazz Orchestra, allcaps and run his own band Prohibited Strangers. Also have played with PLAYorDIE big band and Papajaca (Claudio Kron’s band). In addition, Dj Danny Sheahan will be digging deep into his record collection to spin an eclectic mix of grooves from around the globe. Danny runs Kirkfest, a boutique Summer Festival in the West Yorkshire countryside where Suéli Gil performed earlier this year. 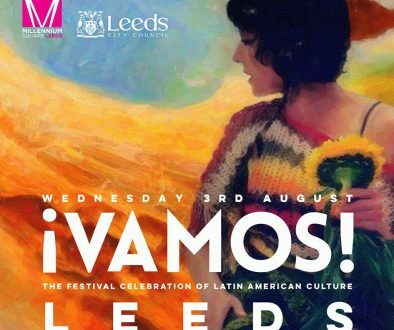 Expect to hear numbers infrequently played outside of Latin America by musicians including Djavan, Elis Regina, Ivan Lins, Dominguinhos, Carlinhos Brown, whose song writing process will transport you to another world.